I went to college in the fall of 1996. This was the peak of the Internet bubble and kids everywhere were making fortunes. It was an exciting time and it seemed just about everything was doing well. Around this time I started exploring my entrepreneurial side. Sure I had the typical lemonade stand growing up. I also had odd jobs but nothing that was mine. I had never thought about starting a company and college but it turned out that way. At the time I had saved a little bit of money and was investing in the stock market. Every day stocks were going up and my friends and I were making money. We talked amongst each other as if we knew what we were saying. We had no idea. Nobody had any idea. Valuations were crazy and none of these companies were profitable. If the name was good and they had an interesting idea, they could IPO and raise endless capital. One after another were doing it and I was believing it all. Everyone was believing. I remember one company called CMGI. CMGI was a holding company that would buy other companies and then take them public. Ingenious, I thought. If all these companies IPO’d and increased 30 to 40% within a month of their IPO, CMGI would be a goldmine. They would line one up after another and take them public. I remember telling a buddy that this was a no brainer. I was invested in most of the names you know. Pets.com, Webvan, Buy.com, CMGI, Kozmo, etc . I had a beautiful blended portfolio of worthless garbage. 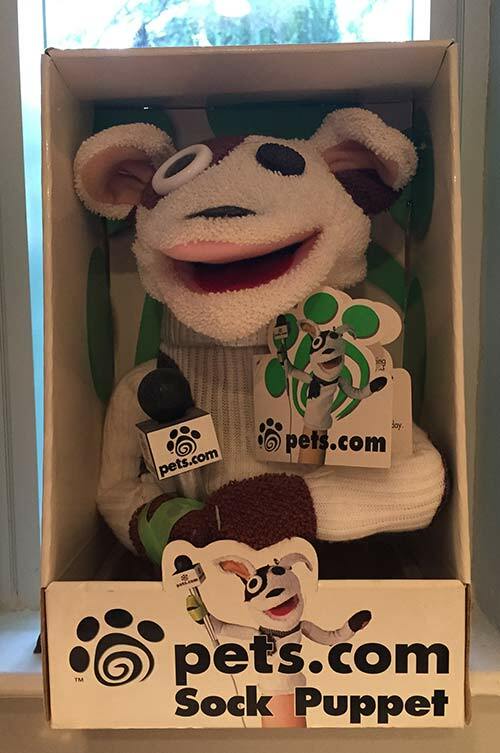 The original sock puppet from the Pets.com commercials. I had to buy one and have him in my closet. I don’t have to tell you how this movie ends. The bubble pops and on we go. Even after it popped though, we all road it down thinking it was merely a stutter. Analysts, who knew nothing either, would say its just a little pull back. But something amazing happened during this time. Regardless of what played out in the stock market, one thing was for sure. The internet was no joke. This was the real birth of the internet as we know it. The birth of new businesses and the ability to build a business from anywhere. The tools now existed for starting a company in college. At the same time that I was trading stocks, I decided it was my time. I was going to work myself on starting a company in college. ebay was young, new and exciting. Not everyone had heard about it at the time. It wasn’t a household name like it is now. I started playing with ebay and was making some spare money. I was selling old things I didn’t want any more. 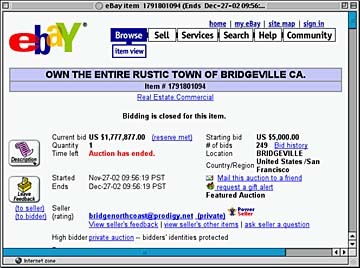 ebay was in its infancy and it was the wild west. I loved it. 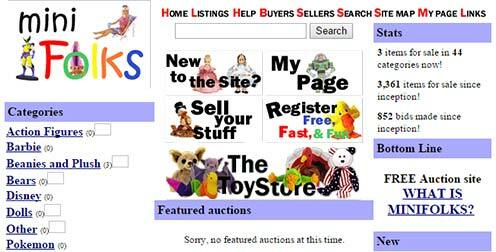 This is the original ebay Site back in the day. I remember going to the flea market in Pennsylvania when I went to visit my girlfriend (Now my wife). I would buy random things and put them on ebay. I was able to make some good money doing this. Unfortunately sometimes the stuff wasn’t exactly “real.” I was young and dumb. Being around ebay though I started to get a feel for many of the people using ebay. I saw a possible opportunity. ebay had just started their endless price hikes. This had resulted in disgruntled ebayers. At the time I had seen what Beanie Babies were doing. There was a cult like following around them. 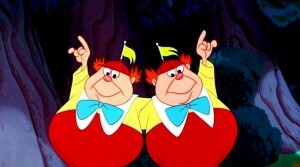 I don’t know if you remember them. They were ridiculous stuffed bears from a company called TY. For some reason people went crazy for them. Not sure what the hype was all about. Between crazy collectors and some animosity towards I ebay I saw a niche. This would be the basis for starting a company in college for me. I decided to try and build a small auction site based around these collectors. It wasn’t specifically for Beanie Babies. 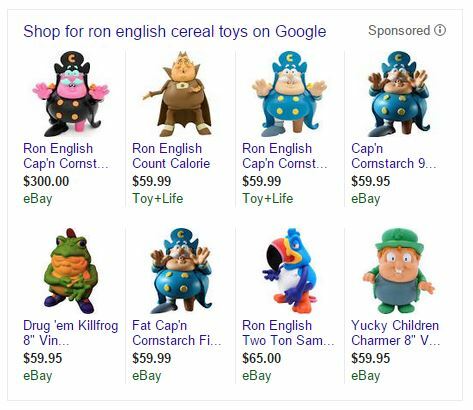 It was targeted to all types of collectible figures, dolls, and characters. I knew that people were serious about their collecting. I was going to try and siphon ebay users away to my site. I was not an avid collector of any of these things myself. I have always had an affinity for toy characters but not a true collector. I knew though that people were passionate about them. Star Wars alone had a cult like following. Here are some that I am actually eyeing now but can’t justify spending the money on. I started doing research and found a prefabricated software solution. The company was selling an auction site almost identical to ebays at the time. I think the whole think cost $3000. I remember borrowing money from my parents and telling them I had this idea. My parents have always been supportive of anything I did. They were all for me starting a company in college. I remember my mom saying that if it all went kaput, it could be chalked up to the cost of an education. At the very least, I would learn some lessons from starting a company in college. I named the company MiniFolks. Get it. Mini Folks. I bought the software which was built in ColdFusion at the time. I knew nothing from ColdFusion or any programming beyond basic HTML. I had the company who sold it to me, host it. They were terrible. 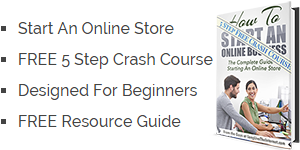 They were some hack shop that had knocked off the ebay site. They were selling the same software to various dreamers like myself. I can’t blame them for selling it but they didn’t care about me once I was sold. I started working on customizing the look and feel of the site. I learned an incredible amount. I had to setup a company, register a domain, setup my email, customize the site, advertise and try and build a business. These were the days of limited information. I self-taught myself everything. I spent countless days driving traffic to the site. In hindsight it doesn’t sound so impressive but at the time it certainly felt it. My Site. Look familiar at all? I spent most of that year starting a company in college and building the business. I was offering the use of the site for free. At the time, I would go through the relevant categories in ebay and click on all the running auctions. Ebay used to display the users email address underneath the users name. I would go through the different auctions and copy their emails. I would send email blasts about the site trying to lure people away. See the emails ripe for the picking? I would post online on forums and try and drum up traffic any way I could. I link exchanged with hundreds of other sites. Ran banner ads and email blasts. Quite frankly I was outmatched and ill equipped. An old forum post that apparently is still alive online. I realized that I had no funds to attack the market from an advertising standpoint. Additionally I didn’t have the ability to build out the site. I could make cosmetic changes but not functionality. I built some landing pages and you can read about how Mattel came after me here. Here were some original banner ads from my site back in the day. I wasn’t a programmer and had limited resources. After a year and a half of starting a company in college and building it, I realized it was time to say goodbye. In the most ironic exit strategy possible I listed the site on ebay. There was no Flippa at the time and this was my best bet. There were limited ways to get the word out. Ultimately I sold the site to another guy somewhere in the Midwest. I made some pocket change once recouping the initial capital from my parents. 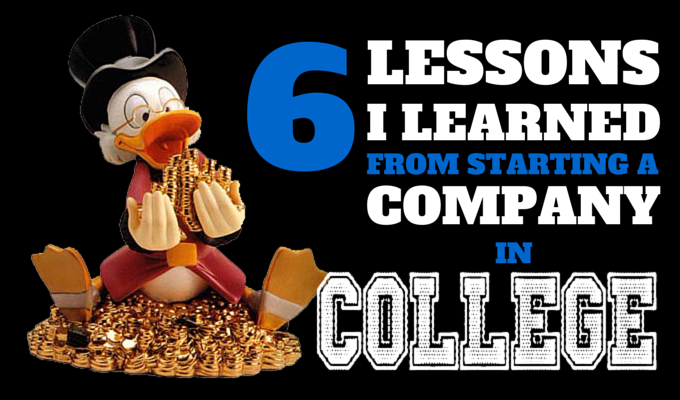 I lost time but I learned countless lessons from starting a company in college. It’s these lessons that are truly priceless. You can still see some remnants of the site today. Apparently the site had been published in this book about Free Stuff for Doll Lovers back in 2000. If your business is going to be a complicated tech platform, you need tech people. If you aren’t a programmer, you are going to have to budget for this. I think about evolution and ebay was rolling stuff out by the hour. All I could do was watch with my static site. You need a marketing plan. Scavenging odd emails from eBay and haphazardly posting online is not a plan. I thought the word would spread faster than it did. It never does. You spread the word, it doesn’t spread itself. You can compete against the big boys but you need to offer something better. I thought free alone would lure people away. Unfortunately if nobody is there to bid on the items, how will they sell? Marketplaces are difficult to build. You need both sides and quickly. If buyers aren’t around sellers won’t be either and vice versa. While I didn’t exit with a fancy IPO and my name in lights, I learned a ton. Failure only makes us better. With the amount learned from trial and error, it’s not fair to call starting a company in college a failure. It was a success. I use lessons from that business today. Getting motivated and taking action is the only path to progress. You can talk through ideas and read blogs until you’re blue in the face. You must take action to start building something for yourself. Whether you are starting a company in college or building something on the side of a full time job, now is the time.